Congratulations you have received your ticket details! If the ticket is for you - no need to do anything more, you are registered with your name and your email address. Your tickets and order receipt can be accessed from the link in your order confirmation email. The order receipt is also attached to this screen. it is now possible for you to update the details on your ticket - namely email address and name (this must be enabled by the admin of the event - if these options are unavailable then the name cannot be changed). If you have registered multiple attendees you now have the ability to add and/or edit the names and email addresses. Newly assigned attendees (people you have given a ticket to) will be emailed automatically to say that they have been assigned a ticket - if no email is entered then no email notification will be sent and you will need to print out their ticket. In the ticket confirmation image below we can see that James has bought two tickets. (this will show after you have bought your tickets, and can be accessed by clicking your email confirmation with the tickets). 1. James needs to assign one ticket to his friend Andre. To do this, firstly click 'Add Attendee'. 2. We now need to remove a ticket from James, and assign it to Andre. 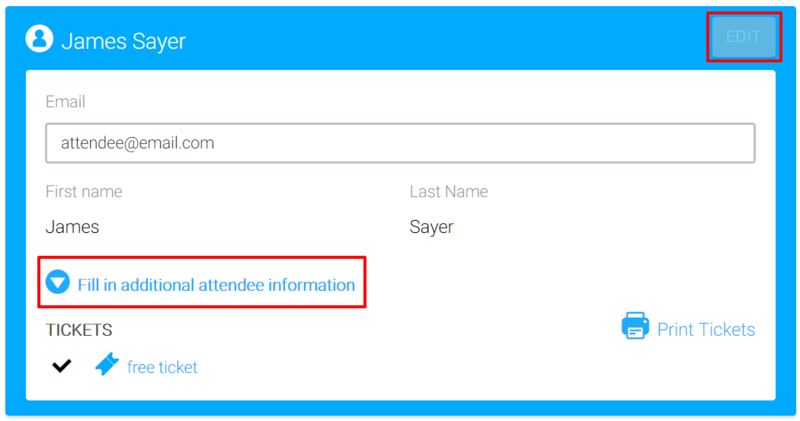 Firstly uncheck one of the tickets from James, enter a new attendee name, check the ticket you will assign and then click 'Save' to save this ticket assignment. The email address should be entered if you wish the new attendee to print their own tickets. Please note: in this example the tickets have not been paid for and printing is disabled. The event organiser may also need some more information from you, and the link to fill out this info is on your ticket. Open the ticket link from your email, click 'Edit', then click on 'Fill in additional attendee information' before finally hitting 'Save'.